Clearly, if you’ve ever seen a commercial on TV or watched a children’s movie, you’re familiar with animation. Have you ever thought about the different types of animation you can use to create energy and interest? Animation may seem like an artistic style that’s out of reach for your videos, but fortunately, that’s not the case. Biteable has a ton of animation techniques and styles you can customize in seconds. From 3D animation to stop motion and isometric animation, there are many different ways to capture the power of animation. The best part? You don’t need to be an artist to understand, appreciate, and enlist different types of animation in your videos. Here’s everything you need to know about the main styles of animation. Three dimensional animation looks extremely realistic. 3D animation, also referred to as CGI, is formed by generating images on computers, which become the frames of an animated shot. Biteable offers many 3D scenes to illustrate and add depth to your videos, such as in the video template below. Animated infographics are a step up from a regular presentation. This style is best for when you’ve got a lot of detail to get through in a short amount of time, or when you have a complex concept you need to explain simply. A bit like animating your PowerPoint slides, infographic animations are a great way to hold your audience’s attention. Biteable has hundreds of infographic scenes and templates that can set you up for success. To make stop motion animation, take a photo of one object, then move it a little and take another photo. Repeat this process over and over and then play the stream of photos back in sequence to give the illusion of movement. Or, if you don’t have hours of time and extreme patience, you could just use the Biteable Claymation templates and be done in a matter of minutes. Isometric animation is known for being geometric and legible. Like the infographic animation style, it’s a great tool to explain complex ideas. Biteable’s isometric animation library has everything from sharks and unicorns to champagne and airplanes. Last, but certainly not least, motion graphic animation is more similar to kinetic typography than the other animation styles covered in this guide. Motion graphics creatively use elements like moving text or design to jazz up your video. Where other animation types tell a story, this type of animation is usually for commercial or promotional purposes. 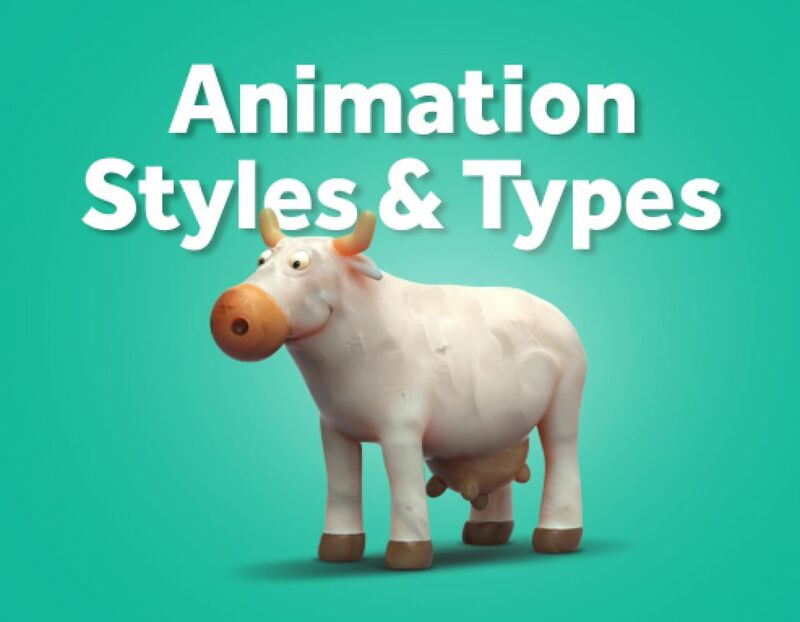 Not sure which animation type is right for you? Biteable has hundreds of templates to choose from, and best of all: you can use them for free! Play around with your storyboard until you find the right look and feel for your video, then customize the colors and music. It’s faster, easier, and cheaper than moving a clay stop motion character 0.1% of an inch at a time!